To me, this is not only one of greatest books ever written but perhaps the only book of its kind. Just imagine: the private thoughts of the most powerful man in the world, admonishing himself on how to be better, more just, more immune to temptation, wiser. It is the definitive text on self-discipline, personal ethics, humility, self-actualization and strength. If you read it and aren’t profoundly changed by it, it’s probably because as Aurelius says “what doesn’t transmit light creates its own darkness”. According to Holmes, this was one book she read over and over again before she even launched her business. Marcus Aurelius is probably my favorite Stoic philosopher, with Seneca as a close second. And in Stoic philosophy I’ve found kindred thought for mental coping mechanisms I had employed since childhood. It refined them further and cemented their place as the guiding philosophy of life for me. Honourable Mentions: Four Hour Work Week, The Happiness Hypothesis, Meditations, Catch 22, A Guide To The Good Life. Meditations, by Marcus Aurelius is one that I’ve read annually since I was in the 7th Grade. It’s the personal journal of the last of the Five Good Emperors of Rome. Meditations delivers wisdom in short reflections and reminders on a variety of topics such as the importance of gratitude, dealing with difficult people, duty, and the individual’s place in society and the cosmos. [...] I first read Marcus Aurelius while translating his maxims in Latin class. They resonated so deeply that I asked for extra quotes to translate as homework! My teacher loaned me his copy of Meditations and I read it through in one sitting. What struck me was that Marcus spoke to himself in the same way that I did, always reminding himself to cultivate his virtue and the content of his character. I borrowed my teacher’s copy of Meditations so often that he gifted it to me when I graduated. It’s been a constant companion ever since, but I didn’t associate it with Stoic philosophy until I was approaching my 50th birthday. We had moved and my copy of Meditations had gone missing, so I purchased a new copy. It was the Gregory Hays translation, which has an excellent overview Stoicism. My list would be (besides the ones I mentioned in answer to the previous question) both business & Fiction/Sci-Fi and ones I personally found helpful to myself. The business books explain just exactly how business, work & investing are in reality & how to think properly & differentiate yourself. On the non-business side, a mix of History & classic fiction to understand people, philosophy to make sense of life and Science fiction to picture what the future could be like (not always utopian). I also want to re-read Meditations by Marcus Aurelius again as well. I love reading the stoics. 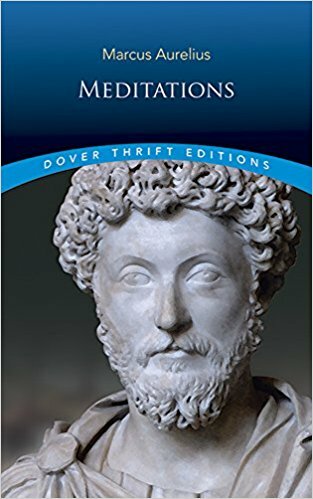 My favorite book is Meditations by Marcus-Aurelius. First, it is very universal as questions and thinking and it can reflect a lot of what one can go through in their life. Secondly, it is a book about responsibility and exercising your responsibility in the world when you have to care about people under you. I have read it several times since I was a teenager. Meditations (Marcus Aurelius) was one of them, and probably one of the most profound impact. Made me get into stoicism and fall in love with roman history. Reflecting the emperor's own noble and self-sacrificing code of conduct, this eloquent and moving work draws and enriches the tradition of Stoicism, which stressed the search for inner peace and ethical certainty in an apparently chaotic world. Serenity was to be achieved by emulating in one's personal conduct the underlying orderliness and lawfulness of nature. And in the face of inevitable pain, loss, and death — the suffering at the core of life — Aurelius counsels stoic detachment from the things that are beyond one's control and a focus on one's own will and perception.